Last week’s decision in the Vergara v. the State of California lawsuit that undermined tenure and seniority rights was a profound slap in the face to teachers who have committed their careers to improving the lives of our children. It was yet another significant victory for those who are seeking to impose corporate education reforms by pitting teachers against children in a cynical, destructive, and utterly counterproductive fashion. As tenured professors in the community college system, union members, and parents of a child in California’s public school system, we have a unique perspective on this matter. Although the “Vergara” decision has no effect on our jobs at San Diego City College, it does affect the professional lives of the educators who teach our son and it will do them, and him, more harm than good. We have had our kid happily ensconced at a tremendous place–McKinley Elementary School in North Park. This is a traditional neighborhood school that has a staff of devoted, loving, highly skilled professionals, many of whom have dedicated most of their careers to this place. Our son is terribly sad at the end of every spring when he has to move on to the next grade level and leave his teacher behind. We couldn’t ask for a better school for him. We don’t want to make it easier to fire his teachers, we want to thank them for the fine work that they do. It has helped our son grow and prosper. Pitting our child against his teachers, as the “Vergara” lawsuit seeks to do, is a fool’s errand. It destroys any sense of community in our schools and heaps scorn on the very people we all want to trust with our children’s futures. The interests of teachers and students are not diametrically opposed, as so many in the corporate education reform industry would have us think, but rather inextricably linked. When we disrespect teachers, we demean our education system and do nothing to help students. More specifically, with regard to the “Vergara” decision, David Welch, a conservative Silicon Valley millionaire and corporate education reformer who has been funding a group called “Students Matter,” won the opening salvo in a battle to deprive teachers of their constitutional due process and seniority rights. The suit, which hid behind a group of poor and minority students, several of whom did not even attend schools where the teachers had tenure or due process rights, alleged that California’s teacher workplace rights infringe on the constitutional rights of students to an equal education–basically saying that hard-won job security, due process (i.e. that teachers cannot just be fired without a process), and seniority adversely impact low-income and minority students by keeping on “bad” teachers and too-often sticking inexperienced teachers in low-performing schools. By focusing exclusively on tenure and seniority rights, the “Vergara” decision brackets off economic inequality, poverty, and the ongoing underfunding of our education system. The majority of schools in California are successes by most reasonable measures as studies show. Yet many of our poorest and at-risk students still fail. Why? The central factor that hurts poor children’s educations is not “bad teachers” but poverty itself and all the aspects of children’s lives that this affects from home environment, to health, to community support. Add to this the systemic underfunding of our education system and the ongoing problems of institutionalized racism and you have a much bigger problem than firing “bad” teachers. The “Vergara” decision ignores all of this. The central myth promoted by the anti-public education “reformers” is that rules and regulations make it impossible to fire “bad teachers.” The facts suggest otherwise. Contrary to the corporate education reform propaganda, a teacher can be fired at any time during the first two years of his or her career. In the course of this lengthy probation period, administrators can fire them for any reason, or for no reason at all. After this probationary period, a teacher can still be fired if their administrator can document a problem necessitating dismissal and convince a panel of experts that the teacher deserves to be fired. 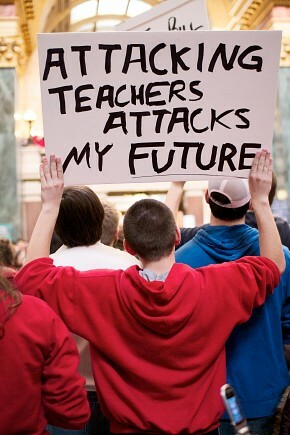 Teachers aren’t guaranteed jobs for life, they have a right to a hearing and due process. This process does not harm students but a system with a revolving door of new teachers would. Indeed, the problem we have in our K-12 system is not that we can’t fire “bad teachers” but that we are having trouble recruiting and keeping teachers, period. One of the bitter ironies of the “Vergara” ruling is that one of the teachers cited by the plaintiffs’ lawyers as “bad” was a recipient of a “teacher of the year” award in Pasadena and several others named had excellent performance records. And, as Michael Hiltzik reported, the Vergara sisters attend a pilot school where none of the teachers have the rights that their lawsuit seeks to end and two other plaintiffs attend a charter school where the same is true. As opposed to the myth that our schools are stacked full of overpaid, underperforming teachers keeping out a wave of eager, idealistic new teachers chomping at the bit to come save the world, attracting and retaining teachers has always been one of the biggest problems in the field of education. Teaching is hard, underpaid, and too often undervalued. Attacks like “Vergara” only make things worse. Most teachers leave the field within the first five years. And, as we see teaching college students, many of our brightest students look at the discourse surrounding education today and say, “Why would anybody want to do that?” Thus just as we most need to be encouraging teachers to enter the profession and stay we are consistently demonizing them. The laws targeted in “Vergara” simply provide due process when a teacher is accused of misconduct or poor performance, and objectivity in times of layoffs. They do not guarantee a teacher a job for life with no accountability but they do provide for basic fairness on the job that more, not fewer of us should have. What most people call “tenure” is merely the right to a hearing before dismissal. This became law through the understanding that political pressures and the arbitrary actions of administrators could and often did destroy academic freedom. Academic freedom is the right to teach to academic standards and curriculum in a balanced fashion, with all points of view aired, rather than through one “approved” viewpoint. It protects the rights of teachers to raise difficult questions and challenge status quo thinking. This is a key aspect of education in a democratic society. Back in the “good old days” before academic freedom, teachers were fired for advocating for ethnically relevant curriculum for minority students, challenging McCarthyism, writing columns like this one, teaching classic literature deemed inappropriate by reactionary school board members, or simply being gay. The list goes on and on. So, if you value freedom of thought and teachers who challenge students to think, you should be concerned about the implications of this case. By focusing exclusively on seniority as the reason for layoffs of bright new teachers “Vergara” ignores the elephant in the room: underfunding. If our educational system was adequately funded, we would never have to deal with layoffs. But we all know it is not. While Proposition 30 stopped the bleeding of our education system in California, it did nothing to restore what had been cut over the last 20 years. And with much of Sacramento pretending that we no longer need to do anything else to fund our educational infrastructure for the future, it’s easier for some to look for cheap answers that don’t require us to face the funding issue. Enter “Vergara” and the assault on seniority. Seniority simply ensures transparency and fairness rather than the arbitrary authority of administrators to rule by whim. Most research shows that experienced teachers actually get better learning outcomes than inexperienced teachers but no one would deny the need for the new fresh energy that younger teachers bring to the classroom. So the bad old teacher versus the good new teacher frame is false If we want good education for our children the answer is to adequately fund our system so good experienced teachers can mentor new ones and we can have the best of both worlds. Getting rid of seniority does nothing. The funders of “Vergara” are not civil rights activists or defenders of public education. They are just using civil rights rhetoric to achieve their goal of destroying teachers’ rights. Consider who’s funding the suit. David Welch is a charter school entrepreneur and his allies include folks like Eli Broad of Parent Revolution and a who’s who of the usual anti-union, anti-public education suspects. Their “students versus teachers” rhetoric is a convenient mask for a privatization and union busting agenda. Thus rather than looking at all the ways we can help make our schools better, we demonize teachers in the service of moneyed interests who cynically manipulate civil rights rhetoric to attack teachers with a well-funded lawsuit. Those same folks were nowhere to be found in the campaign to pass Proposition 30, indeed some of them were against it. Better to demonize teachers than share the wealth with students. Teachers should be evaluated every year by everyone they come in contact with; other teachers, staff, parents, students, etc. If no one approves of this teacher, they are out. I have witnessed teachers who had been teaching for 25 years who were awful. Why do they deserve tenure? Why would a professional want to be paid from a chart instead of negotiating their salary based upon their experience, references, awards, etc? Many of us would love to pay fantastic teachers more money, but when the increases are across the board, and include the mediocre-at-best teachers, we refuse. More than rich people pay property taxes, and many are weary of paying more and more into a system that focuses on PCness and social issues instead of math, science, English, and history. I do not advocate drastic cuts to education, but there is zero connection between per-pupil-spending and outcomes. California, and most other states, had “better” educational systems many years ago when education was a priority in the home for most families, not just a few. How much money is being spent on the students in the bottom 50% who do not care about school, are unmotivated and disruptive, and interfering with the education of others? Education Week proves that you are wrong, there is strong correlation between per student spending and educational outcomes. Baker’s report cited above also made a strong case for the critical role that funding adequacy and fairness have in academic achievement. “A body of literature has now shown the positive effects of equity and adequacy improvements of the prior 40+ years of school finance reform,” he contended. One of the studies Baker cited, was a new working paper public policy researchers from Northwestern University and the University of California-Berkeley that examined the effects of court orders that attempt to equalize funding for poor and wealthy school districts. This is one of the best articles the Rag has ever published. Informed & articulate. The education system, like other aspects of our society, is now under assault by right wing forces, right wing money, brown shirted forces & money. Look what happened to New Orleans school system. If we want to educate our children, teach them how to think, teach them to become non-prejudicial, then we need to become pro-active for them & not reactive when the right takes aim at something they loathe. Read more Diane Ravitch for accurate information. Tenure was bargained for to stop unpopular political views of educators being cause for firing without cause. It has absolutely nothing to do with cost. California schools were better before the draconian cuts to education, to deny that is rewriting history. Great article. Unwashed says it. “The flat out assertion that school funding doesn’t matter is based on the very flawed “research” by Eric Hanushek, an economist with no background in education. (By the way, he is NOT affiliated with Stanford Univ [as is often claimed], he works for the right wing think tank The Hoover Institute, which is housed on the Stanford campus). Hanushek’s method was “vote counting” – pitting studies which concluded that increased school spending DOES matter vs studies with the opposite conclusion. He got the result desired by his employers: more anti-spending studies than pro-spending studies. My recollection of having looked at several of these studies was that they were not done by well informed education researchers who knew how schools operate. “I agree that just pouring money into schools without allowing experienced educators decide HOW to use that money is ineffective. That’s what we’ve had traditionally, and even more so now, with the billionaires and their puppet politicians forcing us to spend on test-prep and test prep technology, and test prep oriented, top heavy administration. More spending without allowing teachers to guide how to spend is and will continue to be fruitless.